The music of Jo-El Sonnier is a way of life. Steeped in passion and relentless dedication. he has been the “King of Cajun Music” for the past 25 years. His fans are dedicated while the music industry elite – Dylan, Costello and Hank Williams Jr., admire his work. He is a “musician’s musician” with a wonderful gift to entertain in a way that is often imitated, but never duplicated. Jo-El was born in Rayne, Louisiana to poor French-speaking sharecroppers. He began to play the accordion at three years of age, first as a toy to occupy Jo-El while his parents visited with neighbors. As he grew, so did his love for the instrument and his ability to play it. Singing only in French, his love of his Cajun heritage was very strong. News of this gifted child spread, which led to a radio debut at the age of six and his first recording session at the age of 11. As a favorite in local clubs, Sonnier remained a Louisiana sensation during his early life, but he then decided to try his luck at recording county music and in 1974 he signed a recording contract with Mercury Records. By the middle 1980’s, Jo-El had a Grammy-nominated recording to his credit with Cajun Life. The recognition achieved with the success of Cajun Life provided the freedom to fuse Sonnier’s deep Cajun roots with country, rock, and other pop influences. In 1987, he signed a new recording deal with RCA records and the result was Come On Joe. Containing several Top 10 hits including Tear-Stained Letter and No More One More Time. In 1988, Jo-El was named by the Performance Magazine, the “New Country Touring Artist of the Year.” Later Jo-El was nominated by the Academy of Country Music for the “New Male Vocalist of the Year Award.” His new album Come On Joe was the only Nashville album chosen by People magazine as one of the ten best albums of 1989. He also won Cashbox magazine’s “New Mail Vocalist” award. The sounds of his accordion can be heard on the albums of such legends as Hank Williams Jr., Johnny Cash, Merle Haggard and Dolly Parton. Jo-El has lent his talent on the accordion to more than 100 artist records. In addition to his virtuosity as an accordion player, he also plays bass guitar, acoustic guitar, drums and harmonica. As a songwriter, Jo-El has had his songs recorded by artist such as Johnny Cash, George Strait, Emmy Lou Harris, John Anderson and Jerry Lee Lewis. Although singing and performing are his first love, Sonnier has also done his share of acting in the movies. Among his credits are roles in Mask starring Cher and Sam Elliott, A Thing Called Love, and They All Laughed. 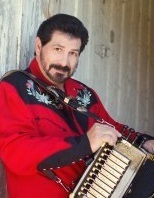 In 2006, Jo-El received his fourth Grammy nomination for his newest traditional recording Cajun Mardi Gras. In October, 2009, Jo-El was inducted into the Louisiana Music Hall of Fame. He was also inducted into the Louisiana Songwriter Hall of Fame. In February, 2011, he released his 30th album titled, Where’s That Music Comin’ From?. Known for his incredible stage performances, Sonnier has performed in 27 countries and 49 states, including the New Orleans Jazz & Heritage Festival and the Edmonton Folk Festival. Jo-El is backed by his band, Louisiana Pride, which features six accomplished musicians. Sonnier said, “I perform every show as if it’s my last, and it doesn’t matter to me if there are only 25 people or 25,000 people in the audience. I still perform the same way.” Anyone who has seen his show will agree. One thing is clear, no matter where he is found performing, his passion and commitment to his music comes across in any language. Tickets for the 6:30 p.m. event are $30 and may be purchased at Perrin, Landry, deLaunay, Dartez & Ouellet, 251 La Rue France, Lafayette, LA, and at the Acadian Museum of Erath, 203 South Broadway, Erath, LA. For more information, contact Event Chairman Robert Vincent at 337-224-8952, Vice Chairman Robert Cox at (337) 706-4407, rnc@cms.brcoxmail.com, Assistant Jean Frigault at 337-262-5810, frigaultjr@yahoo.com; Ticket Chairman Elwood Leblanc,333-658-3078; John LeBlanc at 337-981-3289, Kermit Bouillion at 337-277-0342, kjb7651@cox.net; Tommy Vincent 337-288-2388, tv@infeaux.com; or Warren Perrin, perrin@plddo.com..
Corporate sponsors for the program include The History Channel; Tabasco; Erath 4th of July Association; Perrin, Landry, deLaunay, Dartez & Ouellet, attorneys of Lafayette; Andrepont Printing of Opelousas; Weldon and Fran Granger, Andrew Perrin of Perrin Architecture of Lafayette; Smith Stag and Jones, Swanson, Huddell & Garrison, New Orleans. Additional sponsorships are still available for the event. Varying levels of sponsorship and donations of refreshments and food services are also sought. All proceeds raised will benefit the Acadian Museum and its scholarship program for Vermilion students participating in French language programs.